Are you a fan of the plus size caftans and luxurious loungewear? You must check out the newest Los Angeles based plus size brand, UR2MUCH by Jen Wilder! If you are the type of person who doesn’t like to stand out nor make a statement, then this loungewear collection is not for you. BUT! If you are the type of person who loves all things glam, who loves to make a statement, and indulge in the finer things in life, then this luxury plus size loungewear brand, UR2MUCH, is right up your alley! Back with her newest brand, Jen Wilder has launched her latest brand, bringing over 20 years of experience in fashion to the plus size woman. Made in Los Angeles, UR2Much sources their decadent and whimsical fabrics that they source locally and sustainably! No stranger to launching collections, you may remember Jen Wilder’s last line, plus size activewear from Cult of California! Think lounging by the pool, with a great book and a Lemon drop in your hand… Think hosting a pool party or summer soiree at your home. There is an effortless and cheeky vibe to this collection that will surely make its debut throughout the summer! 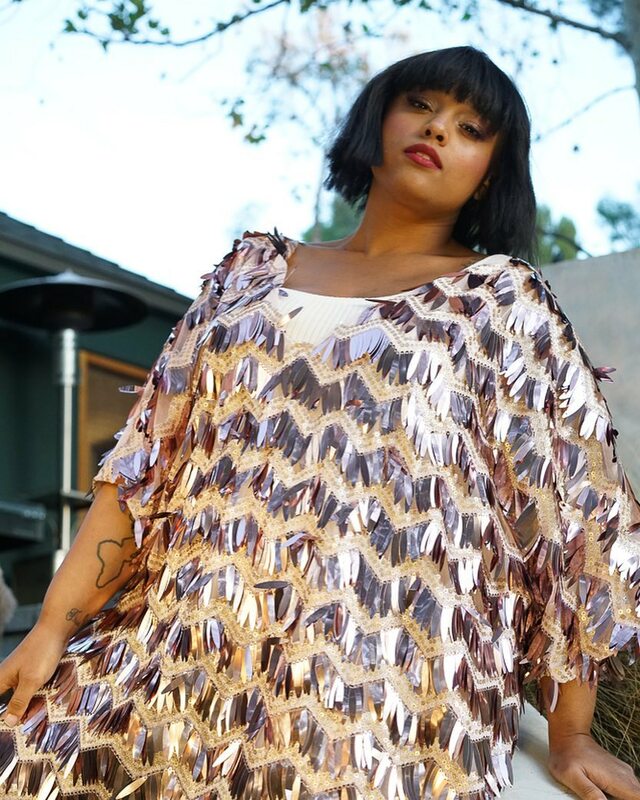 With a collection of plus size caftans and glam cover ups adorned with sequins, glitter, and sheer details, it is yummy! What we dig about this collection is that most of these plus size caftans, cover ups and loungewear pieces are named after the constellations and zodiac signs! So, if you are into astrology, stars, and the cosmos, then you definitely need to check out what this collection has to offer! Heading on a vacation any time soon? These sheer cover ups are sure to give you a little drama and excitement to any swimsuit you pair with these! BUT. You definitely need to move fast, because each piece in this collection is purposely short run, meaning… there is NOT a lot of stock! With the Scorpio Maxi already sold out, from last week’s launch, I can already envision a few other pieces will follow suit! While there is no size chart on the site, we did find out the sizing breakdown! There are two sizes. Size 1 is up to an 18/20 and size 2 up to 24/26! I will inquire if there are plans to extend this, because everyone deserves to be a little extra, right? Let us know what you think about the new line! Which pieces have you curious and excited? Let us know in the comments below! Do you already have a few places in mind, where you’d rock these pieces to? I already see a few options that I’d want to play in, for our TCFCruise! Thank you for the updates! And of course babe! Always here to support!